Electric plugs and sockets Market are power devices, which allow the electric equipment to be connected to the alternating current (AC) power source. These plugs and sockets are utilized for establishing secure electric connections in machines and equipment, which work on different frequencies and voltages. They have high impact strength and offer superior resistance to the flow of electric current. They differ in voltage & current rating, shape, size, and type of connectors. The key players operating in the global electric plugs and sockets market are Legrand SA, Philips, Schneider Electric SE, ABB Ltd., Emerson Electric Co., Wenzhou Chmag Electrical Co Ltd., Mennekes Elecktrotechnik Gmbh, Scame Group, Amphenol Corporation, and Eaton Corp. The global electric plugs and socket market is segmented based on type, power rate, end user, and region. Depending on type, the market is segmented as two-pin, three-pin, four-pin, and five-pin. Based on power rate, it is categorized into high power, medium power, and low power. 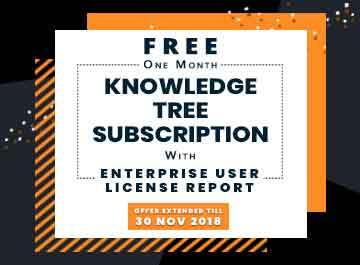 By end user, it is classified into residential, commercial, and industrial. By geography, the market is analyzed across North America, Europe, Asia-Pacific, and LAMEA. The rapid increase in investment on building and constructions, which further fuel the demand for electrical circuit and connection drives the growth of the market. 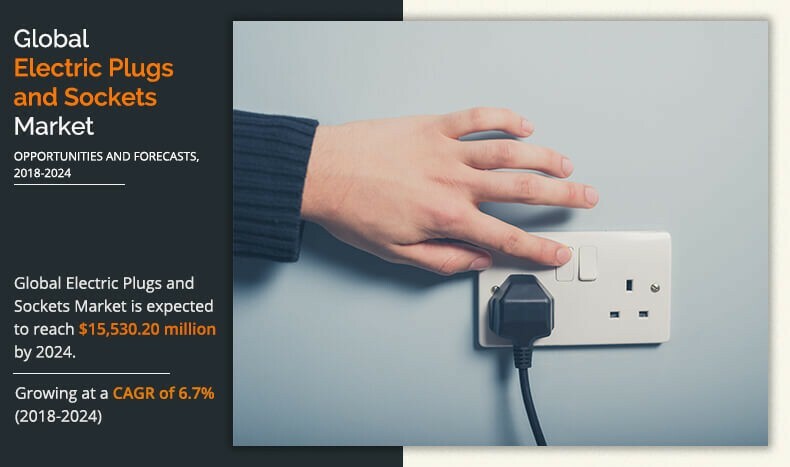 At present, the increase in dependency on more and more electrical products, drives the demand for more number of sockets installation across the residential segments. This in turn drives the market growth. Rapid declines in natural resources and global environmental concern across the world restrict the mining activity across the market, which limits the market growth. This report provides an extensive analysis of the current and emerging market trends and dynamics in the electric plugs and sockets market. In-depth analysis is conducted by constructing market estimations for the key market segments between 2017 and 2024. Key players are profiled, and their strategies are analyzed thoroughly to understand the competitive outlook of the global electric plugs and sockets market. 3.5.1.1. Rising construction and development activities. 3.5.1.2. Swift growth in residential plugs and socket installation. 3.5.1.3. Increasing demand for dust proof & splash proof plugs & sockets. 3.5.2.1. Slowdown in mining industry. 8.1. ASEA BROWN BOVERI LTD.
8.10. WENZHOU CHMAG ELECTRICAL CO., LTD.
Electric plugs and sockets are electrical devices, which provide a mode for power supply. 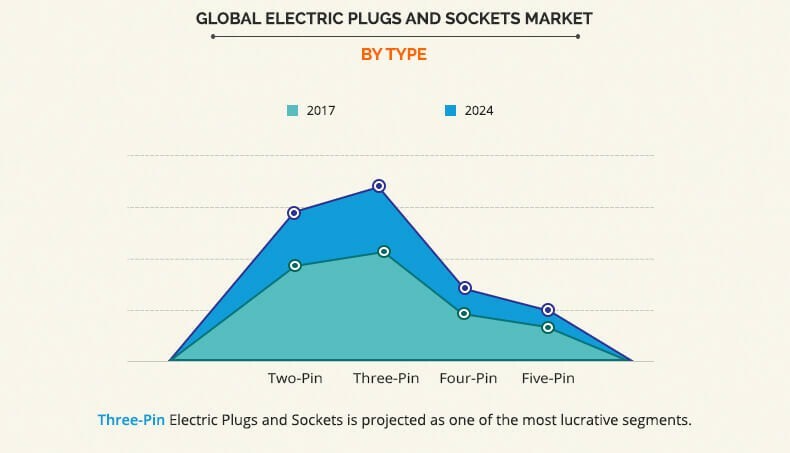 The global electric plugs and sockets market is expected to reach $15,530.20 million by 2024, owing to rise in demand for safe and reliable electrical infrastructure across the globe. Rise in construction and development of urbanization across the globe, increase in demand for safe electrical operations, and rise in demand for dust proof & splash proof plugs & sockets, drive the growth of the market. In 2017, Asia-Pacific was the highest contributor, in terms of revenue, in the global electric plugs and sockets market with 37.62% of share. In addition, the three-pin segment contributed significant revenue to the market, majorly in the U.S. Furthermore, the industrial segment across end user in electric plugs and sockets segments are anticipated to witness the highest growth rate during the forecast period. 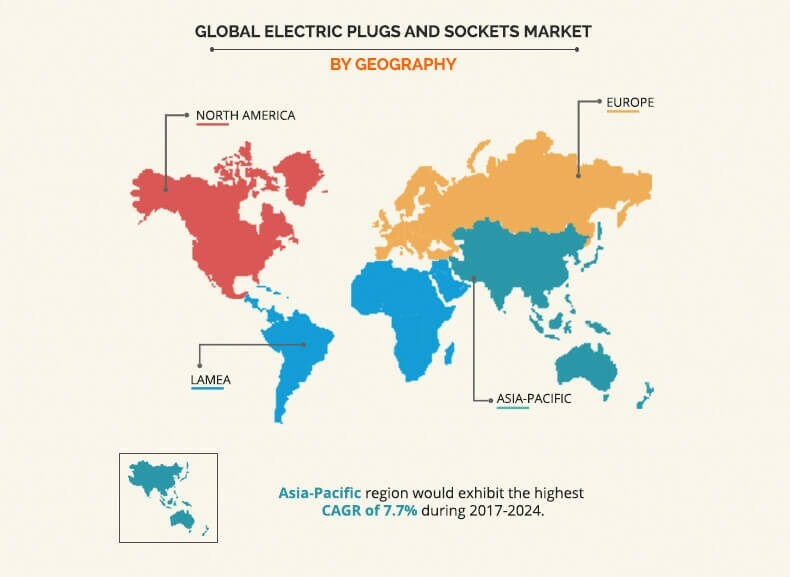 Key market players have adopted various strategies, such as new product launch, business expansion, and strategic alliances to increase awareness about electric plugs and sockets across various countries. "Global Electric Plugs and Sockets Market"